If you look at your 8045 magazine, you'll note that there is an elongated depression, or dimple, on each side of the magazine near the base plate. 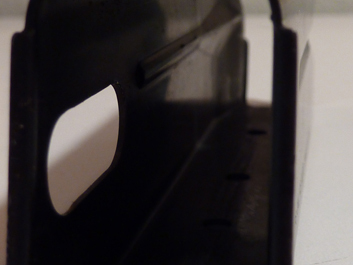 These dimples are intended to prevent the loading of more than 8 rounds into the original magazine, and they must be removed in order to use the magazine extension. This modification will not cause any difficulty should you wish to use the mag at its original 8-round configuration. 8045 magazine modification on SierraPapa's CNC mill. 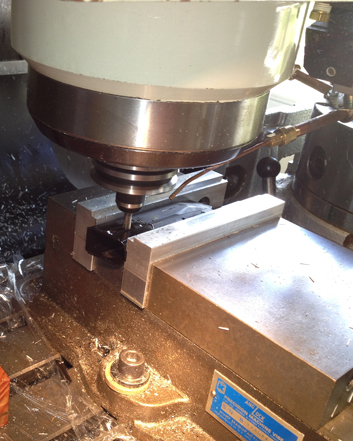 If you wish to make the modification yourself, it is not difficult as long as you have the right tools. The object of the modification is to remove all traces of the dimples on the inside of the magazine so that the movement of cartridges into the extension is not impeded. The cut edges inside the magazine will then need to be smoothed so that the cartridges can move freely, and the burrs on the outside of the work will need to be smoothed so that you don't cut yourself during magazine use.